Well, it’s been a month since my last blog update. 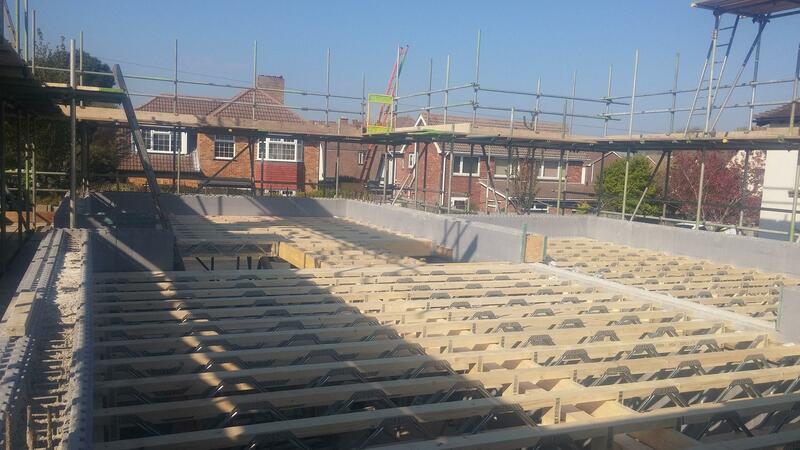 We've witnessed out first concrete pour and now have floor joists so we are all set to build the next floor. The bracing plan we have from JUB looks like we have the potential to pour the second floor and gables in a single pour. This is a decision I'm only too happy to leave to the builders who continue to impress us with their ability to get on with a job regardless. In my last blog we had got on really quickly and had the ground floor pretty much ready for a concrete pour. We needed to wait as there was no rebar on site for the cantilever lintels for the first floor. Our structural engineers had provided a revised structural plan toward the end of February, but it did not have a bar schedule. One was requested and sent through quickly. So far so good, we had the second lot of blocks scheduled for delivery on the 24th March. The original schedule allowed the pour and joists to be in place prior to the block delivery. At the same time as this was progressing the pricing for the next phase was finalised and we gave agreement to proceed. 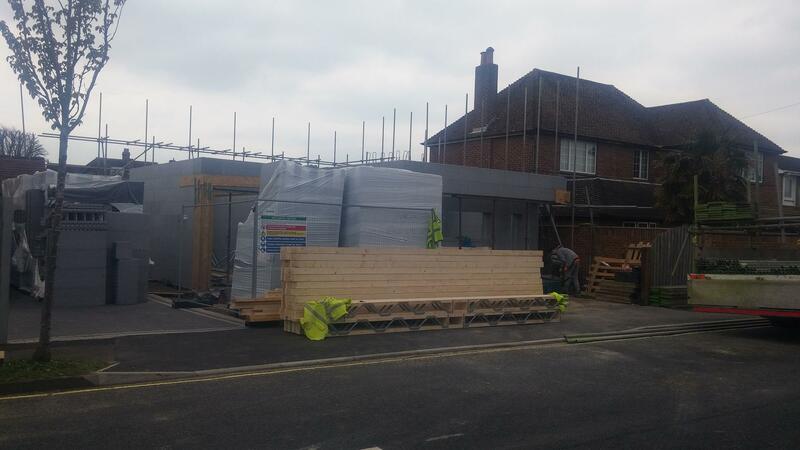 A hiccup with the joist delivery delayed work on site. On a small site the second block delivery pretty much took up all the available space. ICF blocks and a cramped working site are not good news. The ICF is pretty dense but it’s easily damaged when it gets in the way. We ended up playing shuffle the blocks to get the remaining work done and for the first pour. Our builders did a splendid job and just took it all in their stride they were careful with the blocks and didn't complain about the site restrictions once. We had been warned that pours are not for the feint hearted, thankfully in the end ours went pretty well. The only real surprise was the bottom courses of blocks on one side of the build started to move outward on the raft. Fortunately it was spotted and the pour was suspended while Mike and the other lads added some more shuttering. With the new shuttering in place the pour continued and was completed without incident. Apparently it's unusual for the bottom row of blocks to move, but given they are not keyed into the raft and are subject to the greatest concrete pressure it's not entirely surprising. The blocks on the second floor will be keyed into the existing blocks so they should not suffer. With the pour done it was time to get the ledger beams in place to take the first floor joists. Our structural plans had the ledger beams fixed by bolts at 500 centres with the joists at 400 centres. Sounds OK but in practice it’s not ideal as it means you get clashes of beams and bolts, so the plan was revised and the bolts put in at 400 centres so they would not clash with the joist. Ledger beams in place the joist went in pretty quickly, transforming the house. Once you get past the ground floor you need to get scaffold in place for an ICF, not to build from but to prevent possible accidents if someone were to fall through the blocks from the inside. Our builder wanted us to arrange the scaffold, not sure if this is the norm, I suspect it’s liability related. We have used a local firm ROM Scaffold. Their guys arrived on Wednesday and pretty much had completed their work on the Thursday. The scaffold will also allow for our window installation and rendering. Looking forward to getting the next floor up and starting work on the roof.